I saw Lori’s blog post where she had pumpkin oats and I was a tad bit jealous because my local store had a sign where the pumpkin should be that said “coming soon!” I hope we don’t have a pumpkin shortage this year. Otherwise how will I make my pumpkin scones with spicy glaze I’ve been craving once the weather starts to cool? So I looked to see what I had, and remembered that I had peaches from the farmers market that needed to be eaten – soon! OMG, these were so good – just slightly tart – I had 3/4 cup oats to 1 cup water, then added 1 tsp. 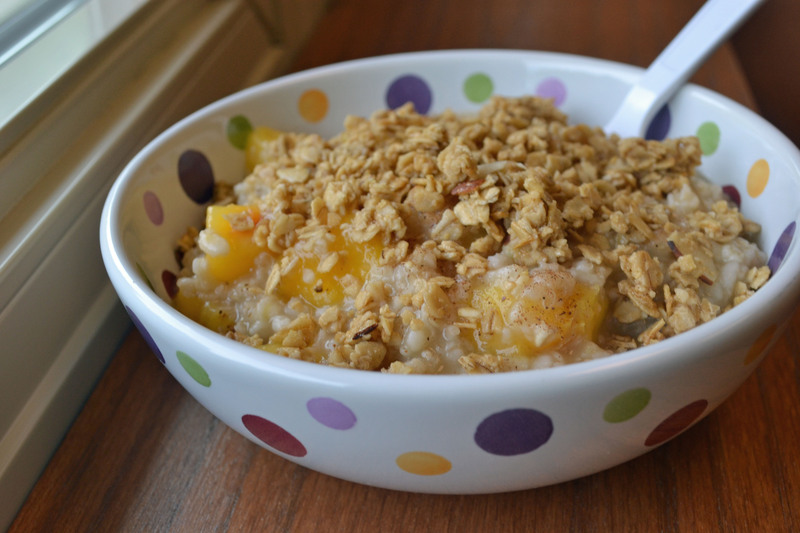 of honey and 2 tablespoons of granola on top – pure summer/fall comfort in a bowl. 😀 Breakfast comes in at 9 points. What works for me probably only works for me – it’s not as cut and dry. I have to time my lunch/workouts from when I ate breakfast, etc. Luckily since my breakfast was high in carbs, my blood sugar was 250 before working out. While some diabetics would freak out about that, I loved that number. It was overcast and 70 degrees when I went out at lunch. I knew I could push myself on my 5k a bit more because the weather was cooperating. I knew almost immediately that I started out too fast – I have that problem, and I know that it takes me a good 10 or 15 minutes to get in the running “groove.” So I slowed down a bit, walked for about 10 seconds, then kept running. Had I not had to reject a song on Pandora at my half-way point, I would never have known that I ran the first 1.5 miles in 16 minutes! When I got back to my desk I was really ready for lunch – I think it was almost 1:45 by the time I ate. I made a spicy thai pork dish that I copied from here. Coat crock pot with cooking spray. Put pork, bell peppers, teriyaki sauce, vinegar, red pepper flakes, and garlic in crockpot. Cover and cook on low until pork is fork tender, 6-8 hours (or on high for 3-4 hours). Remove pork and coarsely chop. Add the peanut butter to the liquid in crockpot, stir well to dissolve. 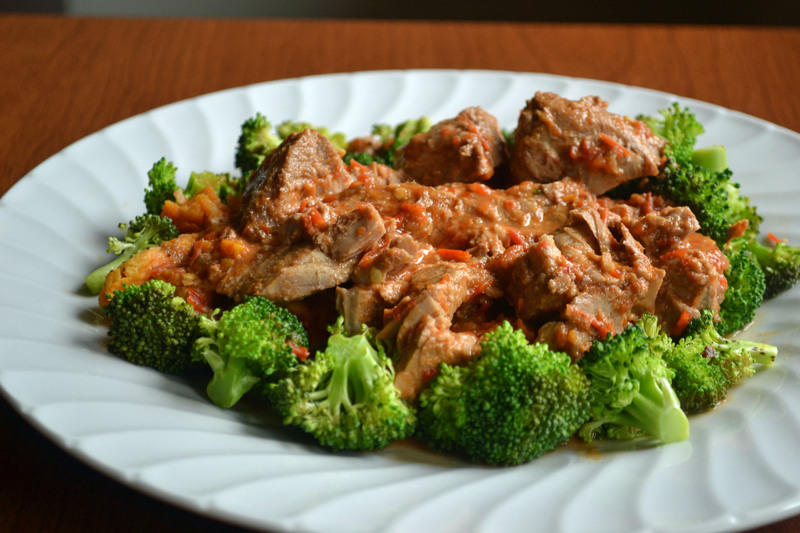 The only thing I did differently was puree the red pepper peanut butter mixture to make a smooth sauce, then I added 2 tablespoons of thai chili paste to kick it up – leave out if you don’t want it too spicy. Return pork to sauce, stir to coat meat evenly. Serve with rice, garnishing with green onion, peanuts and lime wedges. 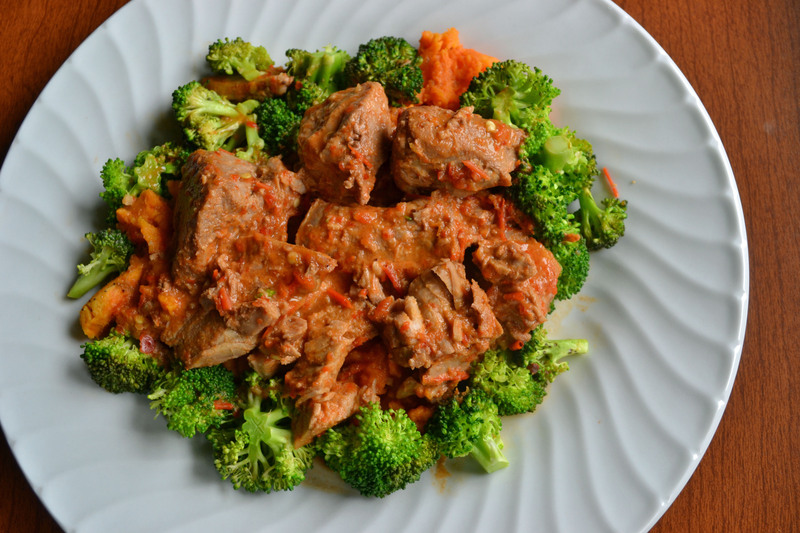 I actually served mine over a cup of mashed sweet potatoes with steamed broccoli – this whole gorgeous spicy plate comes in at 10 points. 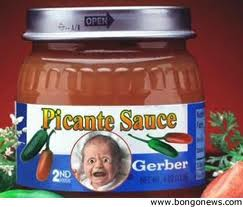 That baby’s face just kills me! So Tony, while feeling better, still doesn’t have much of an appetite, so for dinner I made him buttered egg noodles. So what would I possibly eat? Yep – pizza! i had half of the pizza dough leftover from my fig and goat cheese pizza. 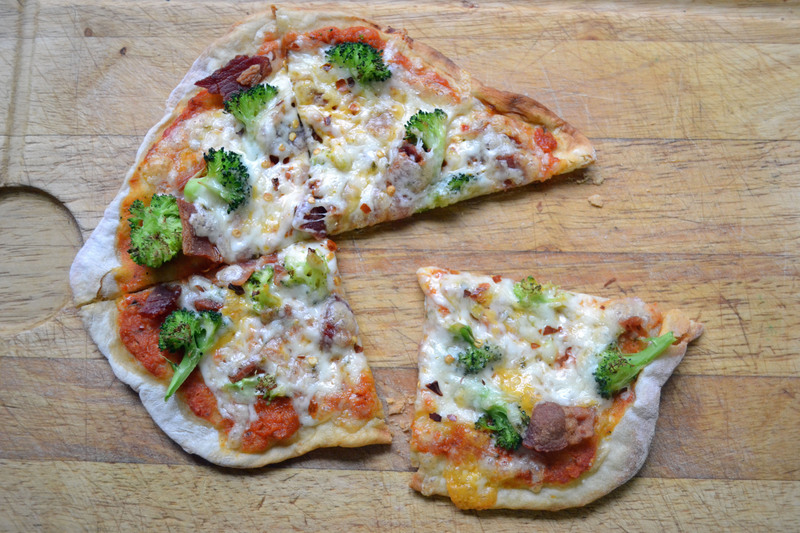 I then realized that this pizza dough recipe is perfect for 2 people to make their own individual pizzas – half of the dough is 6 points, then just build it from there. Just mix together with a wooden spoon, pour onto lightly floured counter and knead it for about 2 minutes. Divide in half and each person can put whatever toppings on they want. 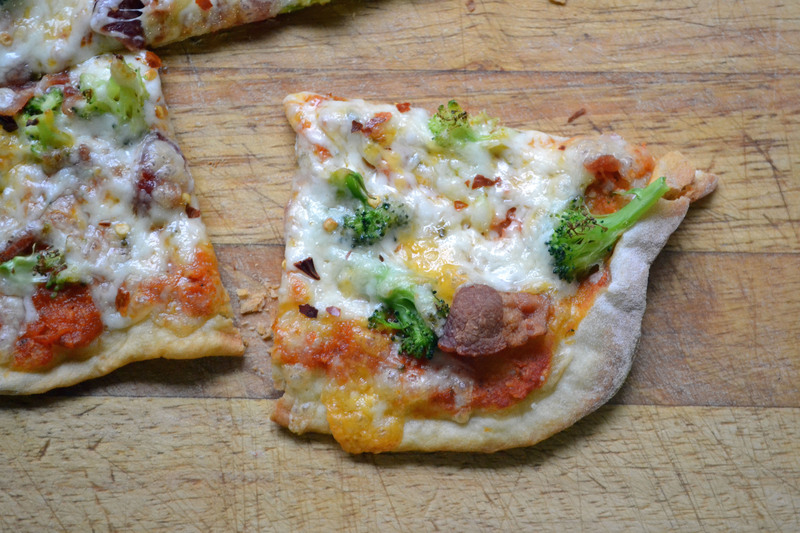 I went with a bacon and broccoli pizza. My pizza all together comes in at 11 points. I was reading Leslie’s post yesterday about how a lot of us didn’t reach our summer goals as we thought we would. It got me thinking because from the start of my vacation and about 10 days afterwards (about 15 days) I didn’t count points, I felt like I ate like a pig, I was really feeling down on myself. But when I weighed in at WW on Saturday, turns out I lost .2. I am headed to my Mom’s house tonight – she’s having out patient surgery tomorrow and I am her designated driver and caretaker. 😀 See you tonight Momma!